First time cross country skiing, or could use some tips and tricks? Sign up for this one day outing sponsored by Meany Lodge. Meet in the Crystal Springs Sno-Park lot#4 at the very back of Crystal Springs Sno-Park at 9:30 am Allow 2 hours drive from Seattle to drive and park. You will meet your instructor Eleanor and Fred. Meany Lodge offers lessons and coaching by PSIA (Professional SnowSports Instructors of America) at their PSIA recognized winter sports school. Learn to glide over the snow while cross country skiing on groomed trails. Children welcomed. On Saturday meet in the Crystal Springs Sno-Park at 9:30 am. There will be 2 hours of class before lunch. After lunch try your newly learned skills on groomed trails on the Meany Campus. Lodge fees and winter parking permits not included. More information on Sno Park Passes can be found here - https://parks.state.wa.us/134/Sno-Park-non-motorized-Permits - Crystal Springs Sno Park requires either a one-day Sno Park permit + a one-day or annual Discover Pass, or a Special Groomed Trails Permit in addition to the Seasonal Sno Park permit. For more information on staying at Meany Lodge, please visit the Meany Lodge page. 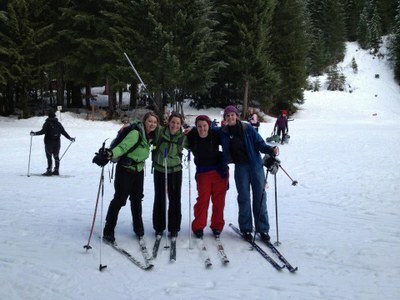 Cross country skis, boots and poles!